Often times, beginners to stock market analysis wonder which technique is more suitable for trading/investing. This article is a guide for choosing between one or both. To understand which technique you should chose, you need to understand what each one is all about first. Fundamental Analysis is the analysis of all factors that can affect a stock’s value, including macroeconomic factors (like the overall economy and industry conditions) and company-specific factors (like financial condition and management). It involves studying the publicly announced financial results and financial statements like the balance sheet and the income statement to understand the financial health of the company and predict the intrinsic value based on which the decision to buy or sell can be made. On the other hand, Technical Analysis is the study of the price and volume history of a stock to predict future stock prices. Pure Technical Analysts believe that whatever fundamental factors are there are already reflected in the stock price and volume. When deciding between the two, one must remember one big advantage that Technical Analysis has, and that is that Technicals always lead Fundamentals. What this means is that bad news will reflect in the stock price earlier than it shows up in the Fundamentals. e.g. when a CEO or CFO is to resign or fired, you’ll start to see the stock go down even before the announcement. Maybe one reason for this is because the prices go up and down because of the collective masses and it is natural for some rumors to creep into the market causing markets to move even before the Fundamentals news is announced. Long-term – with a holding period of 6+ months. Short-term – with a holding period of a few days to 3 weeks. Intraday – those who buy and sell on the same day. Fundamentals are obviously not too useful for intraday traders, but if you are a long-term trader, they are indispensable as you want to be holding companies that are fundamentally sound. With so many companies out there, Fundamental criteria can also help you filter the stocks for short-term trading to maximize your short-term profits. A lot of long-term investors believe that they don’t need to look at Technical Analysis at all. But, we feel a little different. Unless you are Warren Buffett and have plenty of capital that you don’t care about what price you buy a stock, most of us have limited capital and hence want to deploy it properly even if we are long-term investors. In such situations, Technical Analysis becomes the tool to help you in timing, i.e., deciding when to buy and when to sell. 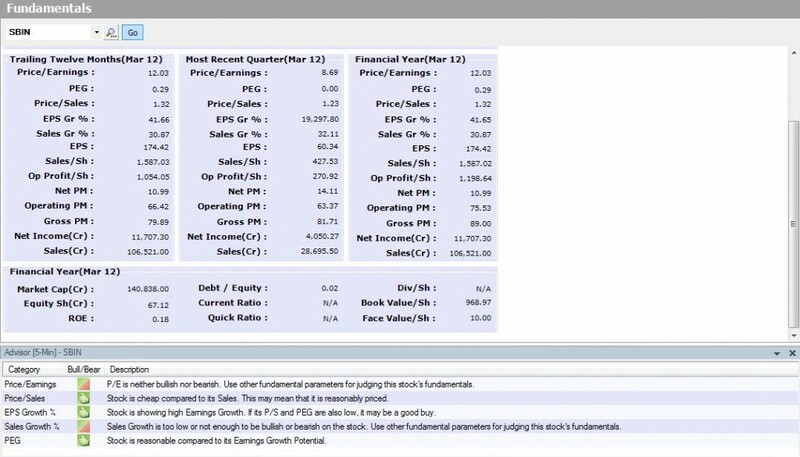 To summarize then, Fundamental Analysis is a great technique for narrowing down the list of stocks that you want to trade (especially if you are a short-term or long-term investor) and Technical Analysis is a great technique for deciding when to buy and sell the stocks in your watchlist. So next time a pure Technical Analyst or Fundamental Analyst tells you that you need to only choose one – you can give him the correct answer! We at investarindia.com have always believed that both have their importance and hence made it easy for you as a trader/investor to use a combination of the two if you so desire. But what to do if you don’t have much knowledge in say, Fundamental Analysis? If you are an Investar user, you can use the Fundamental Advisor and look at stocks which have the most number of “thumbs up” to prepare your watchlist of fundamentally sound stocks as shown below! This entry was posted in Fundamental Analysis and tagged Fundamental Analysis, Investing, Stocks, Technical Analysis. Bookmark the permalink. Thanks once again for a very informative article on Fundamental Analysis & technical analysis.I Enjoyed reading it. It is very informative. Thank you for sharing. For fundamental analysis, you will need few basic skills, understanding the basic financial statements, understand businesses with respect to the industry in which it operates & basic arithmetic operations such as addition, subtraction, division, and multiplication. Thanks for sharing a great article.